Why whitetail? 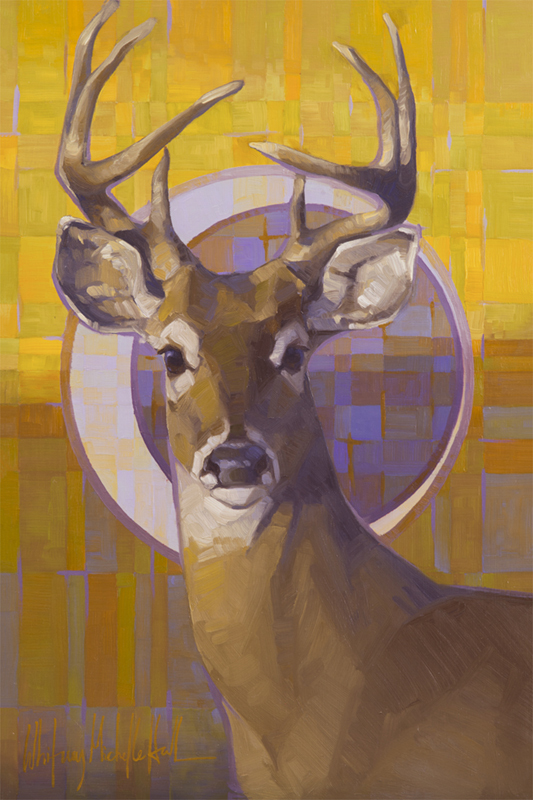 When I decided the first series I wanted to tackle was the seasons, the whitetail deer came to me almost without thinking. While most people see the whitetail as less majestic than their mule deer and elk cousins and others see them as little more than garden pests, they were new to me when I moved to Montana. As I experienced the full range of seasons for the first time, the deer were present and visible outside my windows in each season. I loved their velvety textures, their delicate movement, and their boldness as they scavenged birdseed and tulips alike. From the spotted fawns to the reddish coat of the summer deer, to the buck’s fall antlers and the dull grey winter coats, I felt the whitetail is an excellent representative of how each season affects the natural world. The palettes for all four deer paintings. Each row represents a different painting, with pure colors on either end and mixtures of complementary colors and/or Payne’s Grey toward the center. To really set off the dominant colors of each season, I chose to use a limited palette of only two pure colors plus Payne’s Grey and Titanium White for each painting, meaning that the color range in each painting is only a mixture of three colors* and white. This was a tremendous challenge, as I had to carefully choose each of my two colors to cover all the potential background colors as well as properly represent my subject. I ended up choosing mostly-complementary pairings as they gave the largest variety of possible mixed colors. 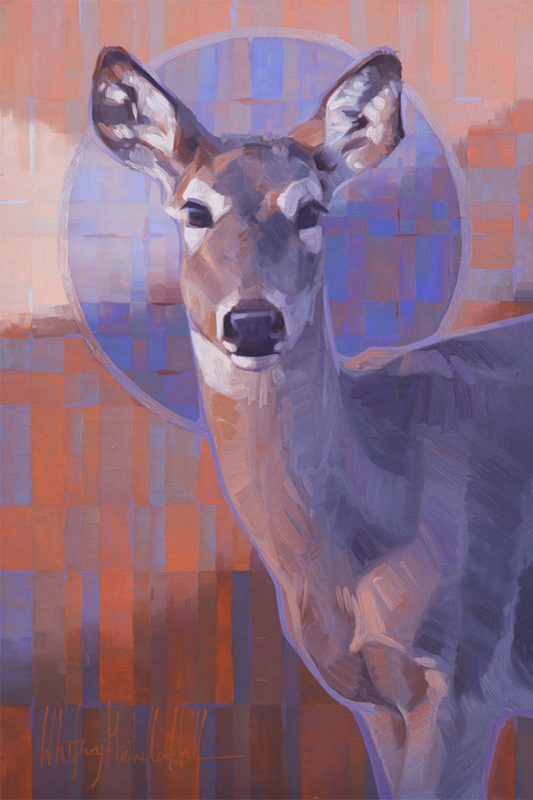 As a compositional element, I eventually decided to arrange the backgrounds of the deer so that they flowed into each other, like a four-part frieze. 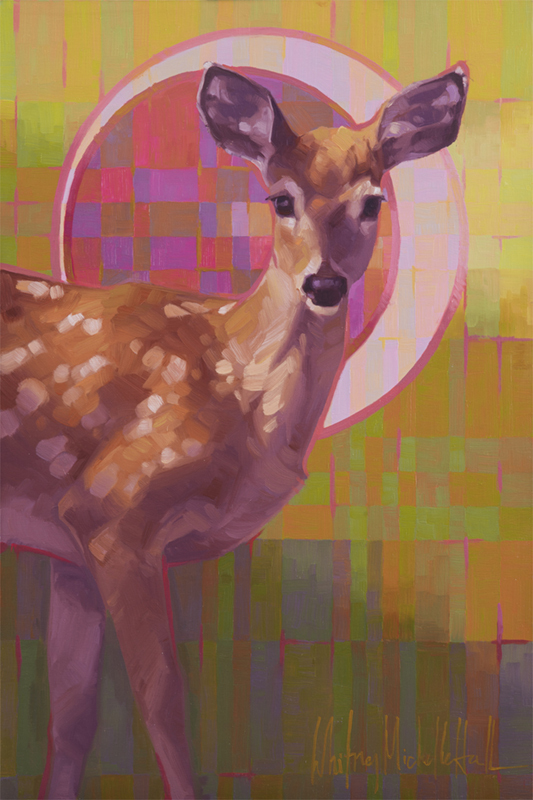 Each deer is surrounded by the abstracted colors of the plant life of the season. As a final design element I chose to put moons behind the deer, both to represent a smaller monthly arc within the larger year’s cycle, and to add interesting negative space and contrasting color to the backgrounds. Each moon corresponds to the season, as a final symbolic note. Spring is a fawn, fresh and innocent. He is surrounded by the colors of spring blooms and new leaves, and is accompanied by the waxing crescent moon. "Sweetgrass Serenade"
Summer is a yearling doe, newly out on her own and full of curiosity. She is surrounded by the lush colors of the chest-deep summer grass, and is accompanied by the full moon. Autumn is a buck, strong and watchful. He is surrounded by the golden colors of aspen and cottonwood, and is accompanied by the waning crescent moon. 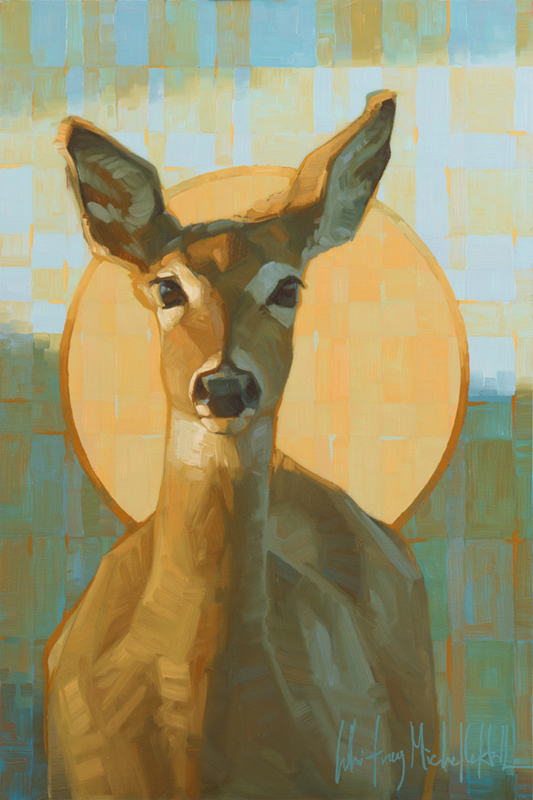 "Willowbranch Requiem"
Winter is a mature doe, cautious and wise. She is surrounded by the coppery color of bare willow and dogwood thickets, and is accompanied by the new moon. Each painting is framed in a 2″ black frame with red accents, and are available through Lovetts Fine Art Gallery. *On three occasions, the “color” I used for one of the palettes ended up being a mixture of two tube colors. Once mixed, however, I did not modulate it but used this new color as though it was a tube color itself, so my palette for that piece was still limited to three “colors.” Nitpicky I know, but I wanted to follow my own rules! Wow, Whitney! Challenging exercise in color theory!